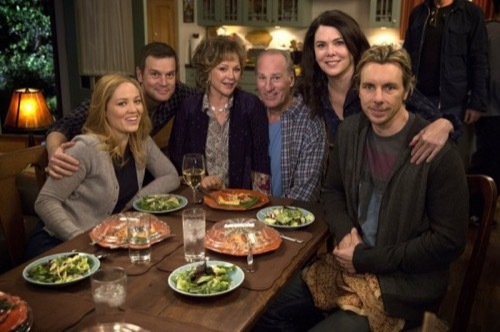 Tonight on NBC Parenthood starring our favorite family the Bravermans returns with an all new Thursday January 22, season 6 episode 12 called, “We Made It Through The Night” and we have your weekly recap below. On tonight’s episode, Amber has labor pains and rushes to the hospital. Meanwhile, Camille [Bonnie Bedelia] and Zeek [Craig T. Nelson] make a decision regarding Zeek’s health; Sarah shares some happy news with Zeek; and Adam take a firm stance as he and Crosby disagree over business matters. On the last episode, Zeek (Craig T. Nelson) and Camille (Bonnie Bedelia) discovered a bundle of old rolls of film, and they asked Max (Max Burkholder) to develop the mysterious photos. Sarah (Lauren Graham) overanalyzes Hank’s (Ray Romano) offered with Julia (Erika Christensen), and the sisters spew their relationship fears. Adam (Peter Krause) decided the future of the Luncheonette with Crosby (Dax Shepard), but Jasmine (Joy Bryant) unexpectedly intervened. Also Starring: Monica Potter, Miles Heizer, Mae Whitman, Savannah Paige Rae, Xolo Mariduena. Did you watch the last episode? If you missed it, we have a full and detailed recap right here for you. Tonight’s episode of Parenthood kicks off with Crosby and Adam hanging up signs at the academy. Edgar stops them and says that he needs a mentor, even though he wants to be a French chef, he insists that Adam be his mentor. Crosby laughs that Adam is the last person that should be teaching any one how to cook French food. At Julia and Joel’s house they sit down with their kids and inform them that Joel is moving back home for good. Victor is skeptical, he thinks that the next time a problem comes up and they fight – one of them will leave home again. Meanwhile, Sarah and her fiancé are arguing over whether they should have a volcano at their wedding and Sarah’s daughter Amber doubles over in pain and says that she is having a contraction. Camille and Zeek are going on a hike, but he has to stop and catch his breath. He explains to Camille that he has decided he is not getting surgery and going under the knife again – he just wants to enjoy what time he has left. She cries and agrees that not getting surgery will be what is best for them and promises him that she will always be with him. After a dramatic car ride, Amber arrives at the hospital where all of the Bravermans are waiting for them, except for Julia and Joel – they are still unpacking Joel’s stuff and moving his stuff back in to the bedroom. He opens Julia’s underwear drawer and is shocked to see some purple lingerie that she didn’t own before he moved out. Jasmine and Kristina are awkwardly sitting in the hospital waiting room. Kristina is furious that Jasmine guilted Adam in to reopening the Lunchinette, she thinks it was a low blow for Jasmine to go behind her back. Crosby walks in, and is shocked to learn that Jasmine talked to Adam, and he can’t believe that Adam only reopened the Lunchinette because he pitied him. A screaming match breaks out at the hospital, and Crosby screams that he quits and storms out of the hospital. Amber and Sarah come out of the hospital room and announce that it was a false alarm and she just has gas. Sarah and Hank discuss their wedding in the dark room, she reveals that she doesn’t want to travel far away for their wedding. He realizes that she is talking about her Dad and she is afraid that she could lose him any day now, and the travel and stress of s big wedding could be too much for Zeek to handle right now. Meanwhile at home, Zeek is sitting on the porch while Camille paints his portrait. He whines that he is cramping up, then he announces that they have to tell the kids they decided to not have surgery. He admits he isn’t ready to have that conversation, but he needs to. They decide to have just the four kids over to dinner and tell them then without any grandkids or distractions. He wants it to be the original six Bravermans. Adam is in the kitchen with Edgar, Max is snapping photos of them to document career week. Max informs Edgar that it doesn’t matter if he makes a soufflé or an omelet because when he leaves school he will be unemployed – it is an Autistic statistic. Adam reassures Max and Edgar that at Chambers Academy all of their students will find jobs. Sarah stops by Amber’s apartment to check in on her after her labor scare. Amber confesses that she is beginning to fear it was a mistake to have the baby because she can’t take care of the baby on her own. Sarah reassures her that once the baby comes out and she holds it with her own two hands “Everything will shift and work out.” She takes Amber’s guitar and plays a song for her. Adam, Sarah, Julia, and Crosby all head over to Zeek and Camille’s house for the original Bravermans dinner. They all start bickering and talking over each other and ignore Zeek’s complaints to “stop,” so he gets up and walks out on them and heads upstairs to lay down. Sarah follows him upstairs, and he explains that he just has to rest a bit, he couldn’t take all of the yelling. Sarah reveals to him that Hank proposed to her and they are going to get married. He says he can’t wait to walk her down the aisle. Kristina and Adam sit down with Max and try to talk to him about his future, they reassure him that just because he is Autistic he will find a job and they believe he will succeed in life. Sarah heads to Hank’s and breaks down in tears and tells him that they have to have their wedding in San Francisco next week so that her dad can come and walk her down the aisle – Hank agrees. Kristina stops by Jasmine’s ballet class where Max is taking photographs and watches in on him, meanwhile at Chambers Adam and Edgar create the perfect soufflé. Amber wakes up in the middle of night in pain, and calls her mother Sarah’s cell phone and tells her that “it is happening and it is real.” Sarah reassures her that she is on her way, and she wants just Amber her mom to come and not tell anyone else. She gives birth to a healthy baby boy, and Camille and Zeek arrive in the morning to meet their grandson. Amber reveals that she named the baby Zeek.